Yet another bottle purchased from the new Still Waters distillery in Vaughn! See earlier posts about this distillery here and here. Also, sorry for the rough pictures, I’m pretty bad at pictures and trying to get better. 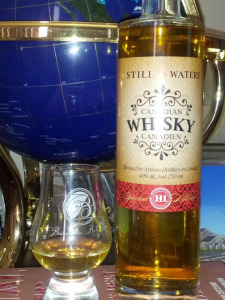 This time we have the 2012 Special 1+11 Blend Canadian Whisky. This is a blend made with other producers, and 10% of it is their new make Rye. It’s called “1+11”, as I remember, because it took 11 tries to get it right. That sounds like they are willing to put in the hard work to make quality stuff, which is a nice sign.